I knew how much she had going on in her life so I just didn’t see how she could pull it off. How does she juggle so many things, have her own business, have more children than me, host these amazing parties, and do it all so effortlessly? Folks, it’s never as perfect as it may seem. No one has it altogether. Superwoman doesn’t have a clone. And no matter how incredible some woman may look or how gifted she is or how thin she is, she has struggles just like you and me. Don’t look at another woman and feel like you don’t measure up. You are YOU, not her. Even if she looks like she has it altogether, I promise she has struggles that just might not be showing outwardly right now. Life is messy, our dreams don’t always pan out, our hopes are sometimes dashed, and we often falter and fail. Don’t try to be someone you’re not. Don’t hide behind a facade hoping that if you look more impressive people will like you. There is beauty in being our real authentic selves. Because it’s only when we are our true selves, that others can love us for who we really are — messes, struggles, and all. In my new book, , I share vulnerably about my own struggle to find safe friends and how being willing to be authentic with others changed my life. If this is something you struggle with, too, I think you’ll be encouraged to read about my journey. You can pre-order your copy here, if you haven’t done so already. So true! Thank you for being authentic with us! We need this!!! This is twice I’ve heard someone “talk” on this topic in the last 3 days. I think God is trying to tell me something. This is so true! And I always appreciate it when someone who seems to have it all together confides his/her struggles. We all have our ups and downs! Just ordered your book! I am very excited! I just love following you and all the awesome deals, recipes, financial, and life tips and strategies you past on your blog and . Thank you. Wow–you have an amazing story! Praise God! We are all still a work in progress. I agree with Melissa! What a blessing and show of strength on your part to now be free of heroine. It sometimes feels like we have not made any improvements in life, though we actually have. 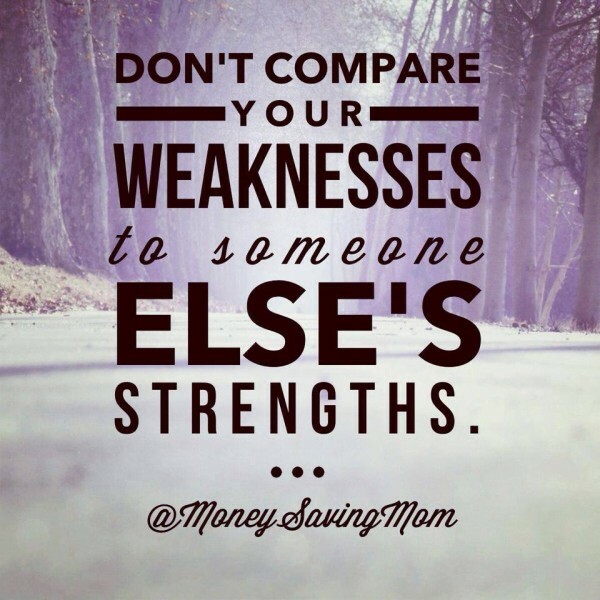 We just need to do as both Crystal and you mention…compare where we were and where we are instead of comparing where we are in comparison to others. I am so inspired by you… to hear of the transformation in your life is just INCREDIBLE! Be encouraged; you might not be where you want to be, but you have made HUGE strides in the right direction and that’s something to celebrate! Have you heard of SuperRad Christian Chick? I can’t really give an endorsemnet because I don’t know much about her nor do I follow her but I read in her bio that she is also a former heroin addict. I just wanted to share in case her blog is helpful for you. Congratulations on your recovery. God bless you for sharing with the MSM community; you might have just inspired other women with addictions that there is hope. I’ve also been thinking about enjoying the process of doing things, not just the end results. If I don’t enjoy the process of something (e. g. I love the result of refinished furniture but hate researching methods, buying paint, prepping the wood, and brushing paint on), then I can choose guilt-free not to do it. I love the processes of sewing and baking, so I can focus on those things because I enjoy (almost!) every step. It’s been a good way to help choose which things can be priorities for me and not get stressed out by stuff. If you’re enjoying the process, you’re not nearly as likely to get worked up when it doesn’t go right! Great insight, thank you for sharing this! I tend to have the mindset that I need to do *everything*. Cook and bake from scratch, garden, repair or build things myself, craft, sew, crochet, the list goes on. I enjoy many of these things, but because I’m so focused on the end result and not the process, I’m finding it stressful to do everything I feel like I should be doing. I need to be better about picking and choosing projects and then really focus on what I’m doing in the moment! The Lord’s been teaching me over the past few years that all of us have struggles, insecurities and things we would change about ourselves. No one has it all together! We are all works in progress!